Fantastic central Rye location, chic contemporary architecture/interior design & unbelievable convenience to so many local amenities- this sparkling new home has it all!! 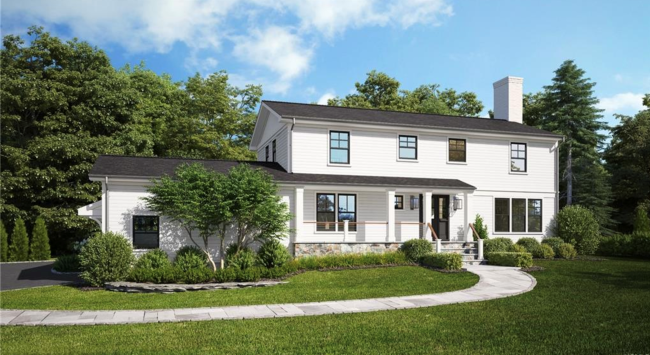 Completely rebuilt in 2019, this perfect Center-Hall Colonial is set on a private, elevated 0.6 acre property on one of Rye’s most sought-after cul-de-sacs, just one block from Midland Elementary School, a few minutes to Rye Middle & High Schools, Rye Beach & Town Park, downtown Rye and 1 mile to Rye Metro-North. The open-plan stylish modern interior features a spacious formal Living Room w. wood-burning fireplace, spacious gourmet Bilotta Kitchen/Family Room combination, formal Dining Room, fabulous mudroom & double-height 2-car garage, gorgeous Master Suite, 3 upper bedrooms, striking modern Porcelanosa bathrooms, large recreation basement & laundry, an oversized rear lawn area with storage shed/playhouse, room for a POOL plus ample space for playtime & large-scale entertaining or cozy family & friends gatherings.